It was a book lover’s dream. Only small wrapped tomes we had brought lay around the beautifully decorated tree. About 15 children’s book writers and illustrators circled up. Before we picked out our packages, we were asked to give brief descriptions of what we currently were reading. How fun to hear people talk about the details of the writing skills of the authors—books they did, or did not, enjoy, and why. Then we took turns selecting gifts. If we wanted to, on our individual turns, we could steal what someone else had already opened. In turn, someone could steal what we held in our laps. Writers kept stealing a book about writing prompts and another about how to write for the screen. The most unique gift was an old book with the center cut out and a gift card and chocolate bar placed inside. Interestingly, no one stole that gift, though the owner had squealed with delight when she opened it. Clearly we were all bibliophiles. My package contained a double delight, which I managed to bring home—How to Get Happily Published and Lemony Snicket Lump of Coal. I’m grateful there are still booklovers among us—people who love the look and feel of a book, people who love to turn pages, people who know what makes for good writing. Books helped save my life after I was diagnosed with highly aggressive end-stage cancer—especially Waking the Warrior Goddess by Christine Horner, M.D. They pointed to important studies that gave evidence for integrative practices I used to help my body return to health. They helped me understand what so-called solutions to avoid. And they helped me heal my life with insights and understanding. The books I read during my journey back toward health are referenced in the back of Thriver Soup. For me, books are not only my treasured wealth, they also are life savers. For a list of resources beyond Thriver Soup, see references used in the book on pp. 358-375. Henry David Thoreau (July 12, 1817–May 6, 1862), American essayist and poet. Note: Virgil Anderson is alive today and receiving life-saving treatment because he found an organization that provided him with the information and support he needed. As we all share what we learn from our journeys with cancer, whether ours or another’s, we can give each other more options and genuine hope. Thank you, Virgil, for sharing this with us. My story of illness and cancer is similar to the struggles of others: I was diagnosed at 50 with the devastating type of cancer called mesothelioma. I am now very sick and fighting for treatment and for my life. I am limited and unable to enjoy the activities I once did. Just breathing is difficult for me now, and I can blame all this on exposure to asbestos. My message is an important one, and I want to educate people about the risks of exposure to asbestos. I want other people to know that prevention is important with mesothelioma and that early detection and diagnosis are crucial for effective treatment. Avoid asbestos, but if you have been exposed, get diagnosed and treated as soon as possible. I grew up in the small town of Williamson, W.Va., and my story with asbestos began in high school. I worked in demolition, taking down buildings with tools and with my own hands. It was hard work and I was exposed to asbestos-laden dust. Disrupting asbestos in older buildings is one of the top ways people are exposed to asbestos fibers. After that job I moved on to others, including working on cars. I tore out and replaced hood liners and made repairs to cars, including working with clutches and brakes. All of these parts contained asbestos. Without knowing the dangers or how to protect myself, I was again exposed to asbestos fibers. Asbestos was once used extensively in so many applications, especially in the construction of buildings. The real dangers of inhaling or accidentally consuming this mineral were not known until the 1970s when regulations were finally put into place. Because I never knew the risks, I worked for years around asbestos and now I have mesothelioma. I am now living with the consequences, as are many other older Americans. Mesothelioma sneaks up on you many years after asbestos exposure. I now have a hard time breathing and even walking. I spend much of my time in bed, unable to do normal daily tasks. My symptoms include chest pain, a terrible cough, and shortness of breath. Treatment is limited for me. Treatment for mesothelioma is already difficult, but my cancer has spread to the lymph nodes so surgery is not an option. I am hoping to undergo chemotherapy, which may shrink the tumors and bring me some relief, but a cure for this disease just isn’t possible. I hope that by sharing my story as far and as wide as I can that I will reach people who may still be able to take steps to prevent mesothelioma or to get screened and treated early. If there is any chance you think you may have been exposed to asbestos, do not wait to talk to your doctor about it. Monitor yourself for symptoms and get screening tests to catch this terrible disease early. My story should help others avoid a similar fate. Clinical trials for leiomyosarcoma (LMS) were discussed briefly Oct. 8 at the National Leiomyosarcoma Foundation patient symposium in St. Louis, Mo. This was one of several cancer treatment topics that I will be reporting about during the coming weeks. Dr. Peter Oppeli, assistant professor of medicine at the Washington University School of Medicine, said LMS is one of the more common types of soft-tissue sarcoma. It is found in smooth muscle cells that naturally occur in the intestines, blood vessels, and the uterus, all of which are in charge of involuntary action in the body. For pregnant women, these muscles play a key role in labor and delivery. LMS can originate anywhere smooth muscles are found. In almost half of all new LMS diagnoses, it is found in the uterus. It also occurs in the body’s extremities and in the abdominal cavity, especially in the back part of the abdomen. There are about 2,000 new diagnoses each year. Compare that to another type of cancer, such as colon, which has about 135,000 new diagnoses each year. Because LMS is rare, it is more challenging to come up with treatments. Any new drug for a rare disease is cause for a lot of excitement. Trabectadine, for example, was approved by the FDA in October 2015. New drugs are approved when they show proven benefit from a clinical trial. Clinical trials are research studies for understanding cancer and how to treat it. Trials can look at new drugs, combinations of drugs, ways to ease side effects, new forms of radiation, and new surgical methods. A Phase 1 clinical trial is for finding the right dose and finding out the treatment’s side effects. A Phase 2 trial involves larger groups of patients. In a Phase 3 trial, large number of patients are treated to confirm effectiveness. The vast majority of clinical trials do not have a placebo-only option. Placebos usually are combined with standard effective treatment, so every patient gets what is determined to be the best treatment. What is research protocol? It is the rule book for each clinical trial. Each trial will have a unique/specific protocol that describes inclusion and exclusion criteria for potential treatment. Is a clinical trial going to help a particular patient? “We hope so, but cannot say with certainty that enrolling is going to be beneficial,” Dr. Oppeli said. Almost every standard treatment has first been proven effective in clinical trials. After his talk there was a 10-minute time period for questions. For more information on clinical trials, go to www.cancer.net for a large video library. If one speaks or acts with a pure thought, happiness follows one, like a shadow that never leaves. Buddha was described by his contemporaries as “ever-smiling.” He knew the secret to true happiness came from pure acts and thoughts. Kylee Brooke Webster found her ever-smiling, happy place when she danced, and made a career counseling adolescent drug addicts. Unfortunately, she was diagnosed with an undifferentiated sarcoma in 2011. Two years later she danced her way beyond the veil of tears. She keeps dancing, though, through a foundation established in her honor during 2014. Kylee’s Dancing Angels assists other sarcoma patients with finding their happy places by providing financial support so they can do what they love. I am most fortunate to already be in my “happy place,” free of evidence of highly undifferentiated endometrial sarcoma and free of medical treatment for five years. 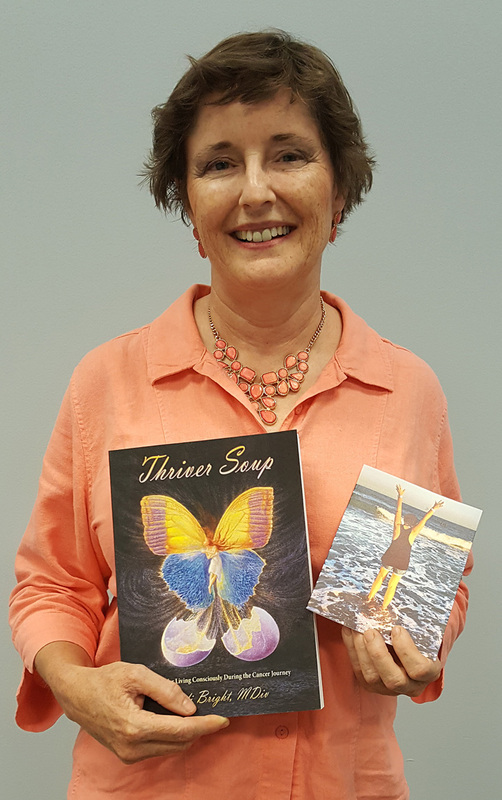 I contacted Kylee’s Dancing Angels to see if they could help me give copies of Thriver Soup: A Feast for Living Consciously During the Cancer Journey to other sarcoma patients to increase their chances of getting to their happy places. Because of the foundation’s generous grant, a limited number of free copies of Thriver Soup now are available to leiomyosarcoma (LMS) patients in the continental United States through the National Leiomyosarcoma Foundation (NLSMF). If you are a leiomyosarcoma patient or know someone who is, in the continental United States, who would appreciate ideas for how to get to a happier place, please contact me for a free copy of Thriver Soup. A limited number of copies are available. We ask, in exchange, that you write a thank-you card to Kylee’s Dancing Angels and make a donation if/when you are able to NLMSF for LMS research. To donate to Kylee’s Dancing Angels to help other sarcoma patients, please visit http://www.kyleesdancingangels.org/.